The pairings are set for the 2013 Big Sky Tournament, so let's take a look at things with a preview and some predictions. Montana was the regular season champion for the second straight season, with their only loss coming on the road to Weber State. The Wildcats finish second, with their only losses coming at Montana and on the road against a lesser opponent. If this sounds familiar, it should - it is essentially the same script from last season. Last year six teams made the Big Sky tournament... three of the other four teams from last year's tournament are out, meaning there are lots of new faces. Among them is North Dakota and Southern Utah, who are in their first seasons in the Big Sky. Northern Colorado and Northern Arizona are back after one year absences, while Montana State joins UM and WSU as returning participants. 1. Seven teams make the conference tournament out of the eleven in the conference. That means that four teams - Portland State, Eastern Washington, Idaho State, and Sacramento State will be watching this at home. 2. Since Montana is the regular season champion, they get a first round bye. Even more importantly, the tournament will be in Missoula on their home-court. Given their home-court dominance (more on that later), this is a huge edge for them. 3. After the first round, teams get re-seeded to ensure that the top seed plays the lowest possible seed. 4. All games except for the final are available to watch for free on Big Sky TV. The championship will be on ESPNU. First two meetings: Weber State won by 13 in Ogden, but needed a miracle finish to beat NAU in Flagstaff in OT. How Weber State wins: They have to take care of the ball. They had 19 TOs in that game in Flagstaff, while forcing only 12. They have the superior talent, they just need to avoid making silly and careless mistakes that could happen if they start to look ahead. How Northern Arizona wins: Gabe Rogers needs to have a big day, and he needs help. He has been on a tear the second half of the year, but he has sometimes had to do it alone. Max Jacobsen (playing great of late) and DeWayne Russell need to play their best games of the year. First two meetings: SUU won the first meeting in Cedar City by 12, while UND won last week's matchup by 7 in the regular season finale. How North Dakota wins: Slow down Jackson Stevenett or Damon Heuir. In the last meeting, Stevenett had only seven points, and the Thunderbirds offense was stagnant all game. UND also has to hit some outside shots, because I am guessing we will see SUU come out and play some zone. How Southern Utah wins: Find some scoring. Since the suspension of Wade Collie, SUU has had trouble finding offense outside of Heuir and Stevenett. If one of those two guys is having an off night, the Thunderbirds struggle to score enough to win games. First two meetings: Each team won on each other's home court. MSU beat UNC by 3 in Greeley, while UNC won by 13 in Bozeman. How Montana State wins: Get some stops. They are 338th in defensive efficiency, which makes it tough to win big games. They also need Flavien Davis and Paul Egwuonwu to keep bringing their A games - both guys have been excellent in the past couple weeks. How Northern Colorado wins: Take care of the basketball, as this can sometimes be their Achilles heel. Defensively, they have to pay attention to their assignments, as they have a tendency to lose their man. Tevin Svihovec and Connor Osborne need to show up and play big. BJ Hill knows what he will get from Tate Unruh and Derrick Barden, but the play of Osborne and Svihovec is the difference for them. Just for fun, here is how I see things shaking out. (2) Weber State over (7) Northern Arizona - This game should be interesting due to the fact that NAU made it such a game in their last meeting, but the Wildcats are just too talented to lose this on a neutral court. (3) North Dakota over (6) Southern Utah - In the regular season finale, UND was locked into the three seed while SUU realistically thought they may have to win to get in. UND's second leading scorer Aaron Anderson played just four minutes. And North Dakota still won. They have more firepower right now, especially with Josh Schuler back in the lineup. (5) Northern Colorado over (4) Montana State - MSU is a team that is capable of making a long run or losing in the first round. It's hard to know what to expect from them. UNC has looked better defensively in the last couple of weeks. Lack of bench production is a concern, but I like UNC to eek out a win in what should be a very competitive, entertaining game. (1) Montana over (5) Northern Colorado - The Grizzlies will be well rested, while UNC will have played the night game the previous night. Derrick Barden will pose problems for the Grizzlies (he averaged 19 and 11 in their two meetings), but the Grizzlies are not going to lose this game. (2) Weber State over (3) North Dakota - Weber State is a bad matchup for UND. With Troy Huff and Jamal Webb, North Dakota is more athletic than a lot of teams, but WSU is not one of those teams. Weber State should win this one handily. - In the second meeting between these teams (which Weber State won by 24), the Wildcats followed a formula that I think will serve them well again - pound the ball inside. In that game, Kyle Tresnak had 19 points on 8/10 shooting, while Frank Otis had 14 points on 5/7 shooting. Montana has no answer for Weber down low. - Mathias Ward is out, and Will Cherry may not be 100%. Ward was their leading scorer, and provided a nice complement to the games of Cherry and Kareem Jamar. Cherry missed the start of the year due to a foot injury, got back, re-injured it again, missed four games, and made it back to play in the finale, scoring 14 points. UM needs Cherry and Jamar to be on the top of their games to win this, and that might be too much to ask of them. 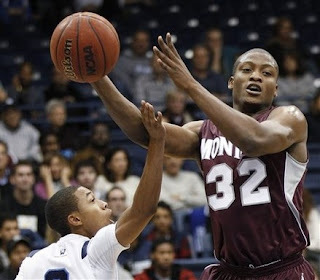 - Will Cherry is playing for Montana, but Mathias Ward is not - It was originally thought that Cherry would miss the rest of the season with a broken foot, while Mathias Ward might make it back for the tournament. Well, Ward had season-ending surgery, while Cherry made it back for Senior Night. - Ken Pomeroy's rankings say Weber State is the best team - Montana has overtaken the efficiency lead for offense (though Weber State has been the best during conference play), but Weber State is far an away the best defensive team in the conference. Weber's defense 3PA/FGA is best in the country - they just don't allow teams to shoot the three ball against them. The Wildcats also lead the country in 3point shooting percentage. Their KenPom ranking is 90, while Montana is 147. - Montana is hard to beat at home - By my count, including tournament games, Montana has won 29 straight home conference games. Considering that they will be playing at home for this tournament, that is a pretty important fact. - Southern Utah and Northern Arizona are trending in the wrong direction - SUU has lost four straight games, and seven straight Big Sky games. Northern Arizona has lost three straight, and is 2-5 in their last seven. If you believe in momentum, this is a bad sign for these teams. - Montana State could be a darkhorse - I have them losing in round one, so why do I say this? Well, look no further than the top two teams. 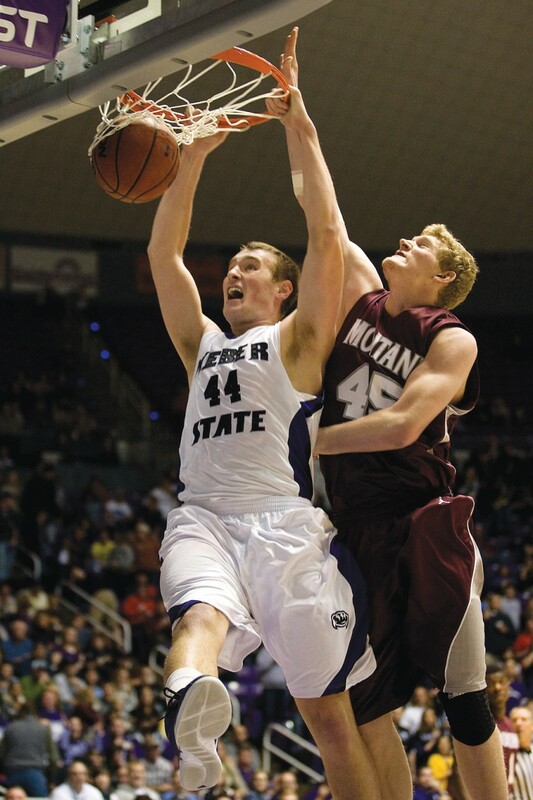 Other than Montana, MSU is the only team to beat Weber State, as they beat them in Bozeman. Nobody other than Weber State has beaten Montana, but MSU got close. Montana needed a late three to send their game to OT before winning it in the extra frame in Missoula. They will not be intimidated by the top two teams. What are your thoughts and predictions? Would love to hear what everyone thinks! No way will Weber's Bigs shoot 77% in Missoula. At home, Missoula is the team to beat, even without Ward and a healthy Cherry. Well done Jon! Just sense that this time is the Wildcats year to shine in tourney. Your analysis says it all clearly. The home court for Grizz will make it a close, well contested game, but it's Weber State's depth & balance making the difference. Time for Rahe to rule over Tinkle for a change. Agree, though, that Montana State could play the spoiler again. Hope not!! Excellent pre-tourney analysis. Don't know if they can be "actual" spoilers, but I believe Northern Arizona & U Northern Colorado have the weapons to challenge. The rematch between North Dakota and Southern Utah a mere 5 days after their regular season finale might also be interesting. Lastly, Montana State appears to have recovered from a mid-season lapse (which was significantly impacted by the absence of two key players). Combined with the new format, this year's tourney holds promise of some intense competition. Pretty decent analysis, with the exception of the pick of the Wildcats over the Griz in the finale. I think that even a "Ward"less Griz team will be tough to beat in Missoula. Wildcats may have the edge statistically (and even talent-wise) but the Griz themselves are rather deep this year as evinced by the victory over the Cats in Bozeman recently (no Cherry or Ward) and Dahlberg Arena will be rockin' come Saturday night! GO GRIZ!!! If that matchup happens it would be a great game, and no doubt the Grizzlies would be extremely tough to beat at their place. But Weber almost did it earlier this year even with Ward playing. Guys like Gregory have improved a lot as the year has gone on, but that would be a tough one for Montana's bigs. Hoping to see that game, would be a classic battle! If Weber St. is able to take advantage inside with Tresnik, Otis & Bolomboy paired with the outside shooting of Wheelright, J.Rich & The "Killer B's" (Berry/Bamforth)tandem will lead Wildcats over N.Arizona, MontanaSt & Montana to get THAT BIG TICKET! Weber is going to be playing their third game in three days. Their talent gap is going to negated by fatigue and the Griz will be fueled by 7000 of their loudest fans. I can't see Weber winning it.